Tyre Life, produced by the Boomerang Alliance is the first detailed guide for the Australian tyre industry, government and consultants on managing tyres safely and to meet high environmental and operating standards. 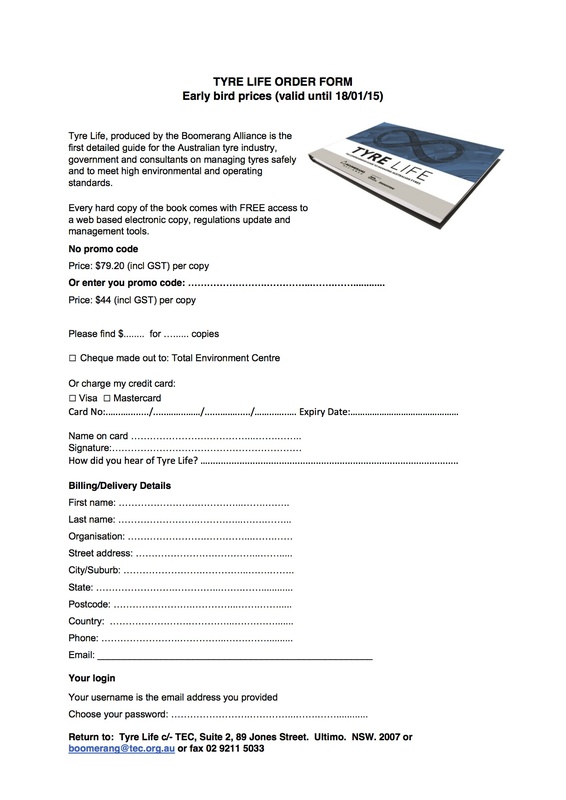 You can buy it online or complete this order form and return it to us (boomerang (at) tec.org.au). You can also buy Tyre Life over the phone: 02 9211 5022. Every hard copy of the book costs $72.00 + GST and comes with FREE access to a web based electronic copy, regulations update and management tools. Please contact us for bulk orders and pricing. Please provide your postcode and suburb to calculate your freight options.